Everyone enjoys coffee in their own unique way. If you’re a traveler, you’re going to want the best coffee travel kit to keep the caffeine levels at the right place. In this article, we interview one Crazy Canadian who is cycling around the world with what he believes to be the best coffee travel set up. Q: What’s in your Coffee Travel Kit and why is it the Best? A: Well, before I begin, I want to say that this may not be the best coffee travel setup for everyone, but it sure does serve me well. My first coffee travel kit made the coffee exactly as I love to drink it. But, I have to admit — it was a bit stupid setup. Q: Wait, why was you “best” coffee travel kit stupid — explain? A: Just look at my coffee maker! It’s made of glass. I got it because I’m hooked on the making coffee with a french press. As you can guess the bumpy roads and the occasional mishandling by public servants led to the accident I so dreaded. It was a tragic discovery and I had no idea it had happened until the morning when I was craving a cup of coffee. I opened up my bag with my travel coffee kit and there was my beloved Bodum French press — completely shattered. Q: So, was that the end of your travel coffee setup? A: No way. I need a cup of coffee in the morning. If I don’t have one, my legs won’t ride all day long — I know, I have a serious problem. Anyway, I didn’t know what to get and ended up buying an Aeropress coffee maker. Q: Why did you choose the Aeropress for your coffee travel kit? A: This was a no brainer after since I didn’t want to have any more coffee equipment breaking as I travel. Although, I have to admit that I got the idea to get this from a friend of mine traveling the world for coffee related reasons. When I saw him with the Aeropress and he made me a cup of coffee, I knew I had to have it. Since the Aeropress is made of sturdy plastic and it can sure take a beating. Trust me, I have tested this repeatedly. Whenever I’m done my coffee, I simply rinse it out with the water remaining in the pot and chuck it back in my bags. You can see why this can make the best coffee travel kit. However, my only concern now is: what do I do when I run out of filters? Q: Ha! Don’t worry, there’s replacement filters and maybe we can mail some to your tent. What’s the address? Can you explain your brewing methods while on the road? A: It’s pretty basic. After I wake up and pack up my tent, I set up my stove and boil a pot of water. My travel stove takes about 3 minutes for the water to boil and in that time I use my Hario hand grinder to break up the bean. Personally, I hate instant coffee and I always have to have coffee fresh from the bean. Otherwise, it can’t be considered coffee. When I’m finished grinding the bean, the water will usually be boiling and the only thing I have to do next it set up my Aeropress, place it on top of my wooden cup, and let the good times flow! Q: You mentioned a friend traveling for “coffee related purposes,” what do you mean? A: Oh, right. When I was living in Japan, a university friend of mine was traveling the world studying coffee culture and building a coffee based community. When he arrived in my city, we toured around a few cafes then went back to my place. He showed off one of his best coffee cuppings. Q: How did he use his travel coffee kit? A: Ah, this guy is a pro and he takes his coffee cupping seriously. In fact, I had no idea coffee cupping was a thing until he performed it for me. The amount of bean you use for your coffee has to be precise as it allows for optimal flavours to be discovered in your cup. The acaia pearl coffee scale let’s you do just that. Using the freshest bean will provide the best tasting coffee. If you use pre-ground bean, you may as well go back to drinking instant coffee. After grinding the coffee and preparing the water, even the water has to be at the right temperature. Too hot and you’ll ruin the bean. Too cold, and you’ll never understand a coffee’s potential. Q: I notice you guys seem to have the same travel coffee kit, coincidence? A: Hey, you know how it is: monkey see, monkey do. After my friend left, I thought his was the ultimate travel coffee kit — it’s truly unmatched. So, I adapted my current coffee travel kit to be similar to his. I’m not as detailed about measuring of my coffee beans and even if I was, there’s no room in my bags for a that kind of stuff. Q: Have you ever used anything else in your travel coffee kit? Sorry — can I mention this? It’s a hilarious book and I recommend it to everyone (English learners and Japanese culture fanatics). Anyway, I was using this book to teach Japanese businessmen some of the finer points of the English language at the bars. Long story short, when I posted an image of it online, a Vietnamese friend on social media demanded a copy. So, I made a proposition: you send me something for your country, I’ll send you a copy of the book. When my gift arrived, I found myself a vintage Vietnamese coffee maker and some of the most potent finely ground Vietnamese coffee — I swear, the stuff was like drugs. I’m surprised it made it through immigration. Q: Would you recommend the Vietnamese coffee maker? A: To be honest, that’ll depend on the coffee drinker. For someone putting together their own coffee travel kit, this little coffee maker would be ideal. It’s small, compact, and it doesn’t take up too much room in your travel bags. Also, when I pulled it out and offered to make some of my travel hosts a cup of coffee, they were thoroughly impressed with the Vietnamese coffee maker. Personally, I think the coffee was too slow to prepare, and I hate to wait more than a few minutes for my cup of caffeine. I did travel with it for a little while, but eventually I regifted it to someone else who really appreciated Vietnamese coffee. Please don’t tell my friend I did that! Q: As you travel from country to country, what kinds of coffee experiences have you had? A: I have to admit, there was nothing notable on my travels until I came to Indonesia. The coffee culture in Indonesia is insane. Everyone is drinking coffee and smoking cigarettes everywhere you go. Often, when I’m cycling in the countryside, the locals have coffee beans laid on a mat to dry out under the sun. I think this has to be one of my favorite places to be. Just the other day I restocked on some coffee beans and I got a kilo of coffee for under $ 5 Canadian dollars. The cost of living is significantly different here and the quality of beans and top notch. I have access to some of the best Arabica and Robusta coffee coming out of Java and Bali. You’ll have to come visit and check it out for yourself. Q: That’s not a bad idea! Do you have any advice for our readers how may be looking to create the best coffee travel kit for themselves? Avoid glass. 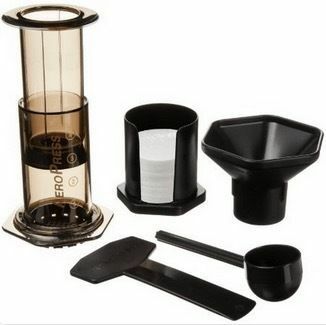 Learn from my stupid mistakes and get an Aeropress, it’s the ideal travel coffee maker. There’s little mess and it can take a beating in your bags. Embrace minimalism. When you’re travelling, you don’t have much room in your bags. Sometimes I sacrifice the space I would have put my underwear just to fit my travel coffee kit. Get a travel mug. This one is kind personal. I was gifted a wooden cup in Japan and it lasted for over a year until it suddenly disappeared. Right now, I’m looking for a new one. Hey Marty, since you’re an expert on this topic, what can you recommend me? Bodum Travel Coffee Press. Since you said you enjoyed the French Press, you’ll likely love this one. It’s a simple french press thermos that you can easily stash in your bags. And, don’t worry, it’s not made of glass so you won’t have to worry about it breaking. Thermos Stainless Steel King 16 Ounce Travel Tumbler. This is a popular travel thermos that you can use to brew a lot of coffee. It should keep your legs powered for the entire day and your coffee hot for 5 hours. Contigo Autoseal West Loop Travel Mug. If you want something small and can fit in the side pocket of a bag, give this a try. It’s made of stainless steel and the price won’t even put a dent in your travel budget. This is my top recommendation. Q. Well Jef, do you have any final thoughts? A: Well, if anyone is crazy enough to go cycling around the world, I think have some kind of coffee kit is a must. Not only is it perfect for the morning, but it’s also one of the best ways to meet new people and make new friends. I always take out my portable stove and brew up a cup for some of the locals. In exchange, I enjoy some of the best memories you could ever imagine. Most people are genuinely good, and, most people enjoy coffee. Put the two together and you’re sure to have an amazing adventure. You’ll never understand this if you don’t have your own travel coffee setup. Jef van de Graaf left Toronto, Canada in 2014 to a bicycle from Tokyo to Amsterdam. He’s currently somewhere in South East Asia and everywhere he goes he has one of the best coffee travel kits to enjoy his favorite brew before pedaling the thousands of kilometers to reach his goal. You can follow his journey right here.